The second kind of cuckoo clock is the 8-day cuckoo clock. This clock is quite similar to the 1 day cuckoo clock, but differs in that it must be wound up every 8 days instead of 1. This is a great option for people who enjoy the look and sound of a cuckoo clock, but are worried about remembering to wind their clock up each day. Again, most 8-day cuckoo clocks come with a night setting so that you are not awoken by the sounds of the cuckoo clock as you sleep through the night. 8-day cuckoo clocks also have larger weights than 1-day cuckoo clocks. This slightly alters the aesthetic of the clock. 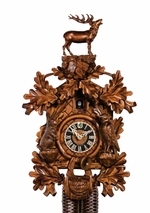 Browse our wide range of imported German, high-quality 8 day cuckoo clocks. We know any of our 8 day movement cuckoo clocks would look great in your home. Much like other mechanical clocks, cuckoo clocks contain a tight spring that provides the force to keep the clock�s gears in motion. After a set time, the spring unwinds, driving the gears and internal mechanisms to a halt. Rewinding the spring tightens it and gives it the tension necessary to function. Cuckoo clocks offer an excellent balance of looks, class, and reliability. The eight-day clock movement describes a clock that was designed to be rewound every eighth day, or approximately once a week. A one-day clock must be rewound every day. At My Cuckoo Clocks, you will find a wide range of 1-day and 8-day windup cuckoo clocks to fit your style and fill your home with lively cuckoo calls. Please take a look through our inventory that includes hunter, musical, chalet, quartz, grandfather, and authentic 8-day windup clocks. If you have any questions, please don�t hesitate to contact us.